Former Oklahoma quarterback Kyler Murray might be shorter than NFL scouts would like, but his instincts and athletic ability more than make up for it. Could Murray play professionally in both MLB and NFL? Domonique Foxworth wants Heisman winner Kyler Murray to play both football and baseball professionally. Oklahoma QB Kyler Murray discusses the season he's had and the advice Baker Mayfield gave him about the Heisman process. 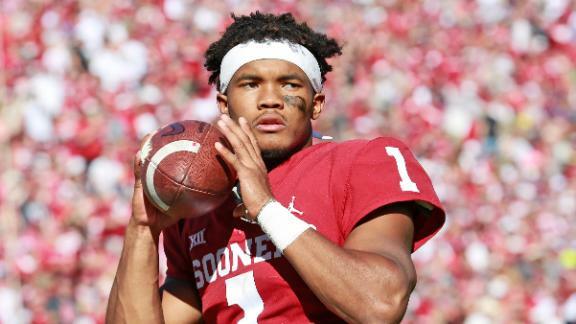 Mel Kiper Jr. says Kyler Murray would be the No. 1 pick if he was slightly taller. Todd McShay disagrees, saying he'd already be a first-round pick. After throwing for 40 touchdowns and leading the Sooners to the Big 12 title, Kyler Murray got Oklahoma back to the CFP. Dan Orlovsky and Laura Rutledge debate whether Tua Tagovailoa or Kyler Murray should win the 2018 Heisman Trophy. Tim Tebow visits Heisman hopeful Kyler Murray to discuss their mutual love of baseball and Murray's hopes of leading Oklahoma to a national title. Should Murray choose baseball over football? The Around the Horn crew reacts to Oklahoma quarterback and Athletics prospect Kyler Murray saying he still plans to give up football for baseball. Desmond Howard says Oklahoma quarterback Kyler Murray's performance will determine how the Sooners will fair against Texas. Brad Edwards explains how Oklahoma QB Kyler Murray has somehow filled Baker Mayfield's shoes and then some. Tim Tebow breaks down why Alabama QB Tua Tagovailoa and Oklahoma QB Kyler Murray are his top two picks to win the Heisman Trophy. QB Kyler Murray runs 10 yards to end zone, extending Oklahoma's lead over UCLA 21-7. Heisman Trophy winning RB Ricky Williams joins College Football Live and, along with Brock Huard, reacts to Texas A&M coach Kevin Sumlin giving QB Kyler Murray a day off from practice. Auburn intercepts three passes in a 26-10 win over Texas A&M.